For a beautifully modern look, add VIGO’s Pirouette Shower Door to your bathroom. This model features a clear tempered glass pivot door and a fixed side panel that work together to adjust to openings from 30 to 36 inches, even allowing for out of plumb walls. 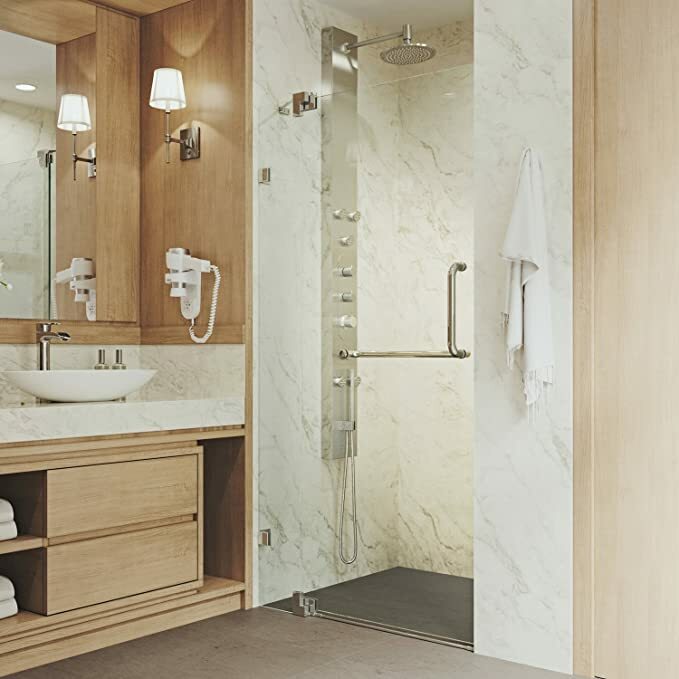 The integrated door handle and towel bar can be mounted with either facing out, adding to the versatility of this frameless design. Glass supports adjust to accommodate out-of-plumb walls, making it possible to have a seemless installation. Clear seal strips keep the shower watertight, preventing leakage. Stainless steel construction hardware ensures superior quality and durability, VIGO lifetime guarantee to never rust. Fixed arm support ensures wall anchoring and reinforces wall stability. With reversible left or right-sided installation and an adjustable opening up to 6 inches, you have an option to meet your exact needs. Bring your showering experience to the next level by adding a VIGO shower panel and create your own personal oasis. 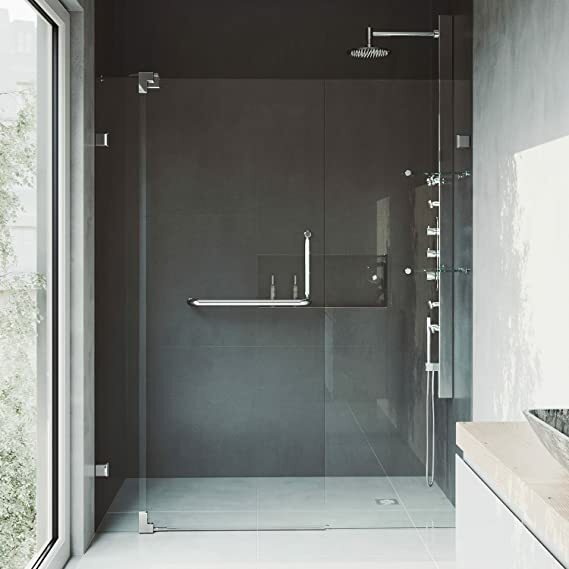 For a beautifully modern look, add VIGO’s Pirouette Shower Door to your bathroom. This model features a clear tempered glass pivot door and a fixed side panel that work together to adjust to openings from 30 to 36 inches, even allowing for out of plumb walls. The integrated door handle and towel bar can be mounted with either facing out, adding to the versatility of this frameless design. Glass supports adjust to accommodate out-of-plumb walls, making it possible to have a seemless installation. Clear seal strips keep the shower watertight, preventing leakage. Stainless steel construction hardware ensures superior quality and durability, VIGO lifetime guarantee to never rust. Fixed arm support ensures wall anchoring and reinforces wall stability. With reversible left or right-sided installation and an adjustable opening up to 6 inches, you have an option to meet your exact needs. Bring your showering experience to the next level by adding a VIGO shower panel and create your own personal oasis. Oil Rubbed Bronze finish is exclusive to VIGO and may not directly match other manufacturer’s similarly named finishes.